Sometimes it’s best to sell in May and just stay away. Especially when a firm’s dividend stream is being eaten alive by Amazon & Co. Worse, even skilled market timers don’t have much to work with. Hulbert found that over the past 60 years, rallies from June’s lows into highs over the next two months averaged 6.9% — the third-lowest such rally potential, behind (you guessed it) July and August. So should we buy these names back in September? For this disastrous four, just sell and stay away. Big-box retailer Target (TGT) has lost roughly a third of its value since 2016, and unfortunately, there’s no single thing to pin it on – and thus no single quick fix. The company is throwing things against the wall to see what will stick, introducing new brands and expanding its small-format stores while trying to squeeze more sales out of its website. Whether Target can do it remains to be seen, but it’s swimming upstream against Amazon.com (AMZN) and the growing sprawl of e-commerce, including an increasingly feisty Walmart (WMT). And your reward for holding on while Target tries to successfully execute a turnaround strategy? A risky 4.3%. You can find surer retailers and higher dividend payers. Don’t wait up for Target. “Bankruptcy” shouldn’t be one of them. That’s a word increasingly being floated about concerning Ohio-based utility FirstEnergy (FE), however, which is among the riskiest plays in the sector right now. Institute for Energy Economics and Financial Analysis report author Cathy Kunkel says that six of FirstEnergy’s coal and nuclear plants are at risk. “In the fourth quarter of 2016, FES took an $8 billion loss to write down the value of its remaining coal and nuclear units — an acknowledgment that FES’s coal and nuclear plants have lost 88 percent and 90 percent of their value, respectively,” she said. Worse: FirstEnergy seems to agree with much of the IEEFA’s analysis of the company’s difficulties. The analyst community is becoming bearish, too, with Christopher Turnure recently dropping FE’s price target and downgrading the stock to “Neutral” over its exit of the merchant business. Utility stocks are supposed to generate income, not headlines. Don’t risk FirstEnergy going nuclear – get out. The situation at Macy’s (M) is bad. Macy’s shares are off by roughly two-thirds since 2015, because Macy’s operations are in terminal decline. Revenues have dropped for two straight years, income is off roughly 25% since 2013 alone and Macy’s is, ahem, “streamlining” its store portfolio by 100 locations. In other words, these Macy’s locations are performing so poorly, it’s not worth it to keep the lights on anymore. We’re now getting to the point where Macy’s is being pressured to spin off its real estate as a REIT, and buyout rumors are starting to pop up, like the Hudson’s Bay talks that quickly unraveled. That’s great if it happens, but for now, Macy’s has to survive on the merit of its own business, and that business is deteriorating, as Q1’s big earnings and sales misses verified. The clincher? Macy’s, which regularly sends out a press release dedicated to its quarterly dividend – whether it’s “Macy’s, Inc. Board Declares Quarterly Dividend” or “Macy’s, Inc. Increases Share Repurchase Authorization by $1.5 Billion, Declares Regular April Dividend and Announces Intent to Increase July Dividend” – did no such thing this quarter. Instead, its dividend declaration was slipped quietly into its first-quarter earnings release. Why? Because Macy’s didn’t want to draw attention to the fact that instead of boosting its dividend like it usually does this time each year, it kept the payout flat at 37.75 cents per share. 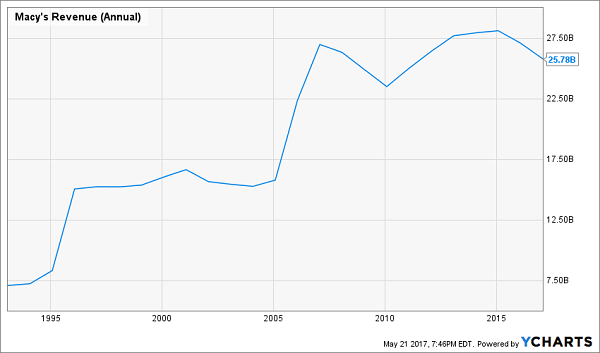 Dividend growth has stopped. Let’s stop pretending Macy’s is going to turn this around anytime soon. 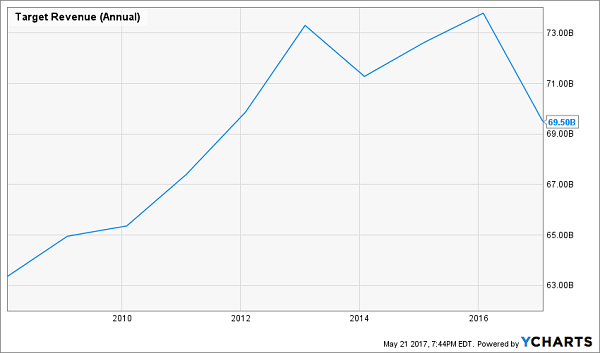 What’s not to like about Annaly Capital Management (NLY)? 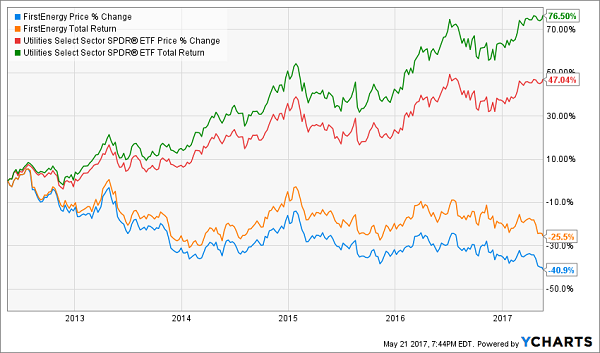 The mortgage real estate investment trust (mREIT) sports a yield in the double digits, and it’s actually beating the market so far this year with a robust 17% charge higher, putting it at levels last seen in 2014. 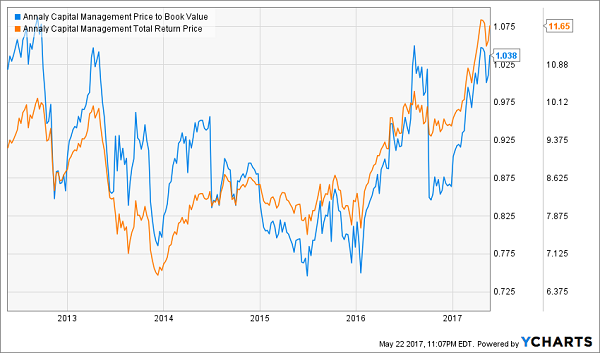 Annaly’s run now has it trading at a premium to book value, so at the very least, it doesn’t make sense to buy here if you’re a bargain hunter. In fact, its P/B now sits at multiyear highs. But also troubling were recent first-quarter earnings, which weren’t enough to cover its dividend of 30 cents per share. More worrisome is the company’s switch to core EPS, which will provide a more accurate look at how NLY is performing, but also could be more volatile amid interest-rate changes. While last year’s Q4 saw a nice one-time bump, core earnings for Q1 of this year dropped to 29 cents per share – not even enough to cover the 30-cent dividend. Annaly’s fundamental weakness and big year-to-date run are the perfect setup for a summer slump should the market throw a fit. This 10% yielder is a trouble just waiting to happen. Annaly (NLY) Is Hot, But Don’t Get Burned! What good is a 4%, 7% or even 10% annual dividend yield if you’re racking up similar losses or worse? You need to be averaging roughly 8% in overall annual returns, which means any investments that are treading water or losing ground are literally setting back your retirement timetable, sometimes by entire years! If you want to retire comfortably, you need a multi-tooled portfolio that not only offers big headline yield, but also dividend growth and the potential for capital gains, too! And you can find these kinds of “triple threat” stocks in my “No Withdrawal” retirement portfolio. I shudder when I think of some of the mediocre stocks festering in most retirement portfolios. Yes, no-growth blue chips that yield 3%, maybe 4%, might keep you from losing money, but they’ll also keep your retirement stuck in neutral! Think about it: Even if you’ve saved up $500,000 for retirement, 4% annually is just $20,000 a year. You and I both know that even with Social Security tucked in there, that’s a skimpy retirement. My “No Withdrawal” portfolio averages 8% across the board right now, and offers dividend growth that will result in double-digit “yields on cost” over time. That will ensure you have every cent of income so you can pay the bills and have plenty left over to actually enjoy your retirement years. Meanwhile, the growth potential of these picks will help grow your nest egg, which is essential should you ever need to pay for a big one-time expense, whether it’s an emergency or just buying a vacation home.